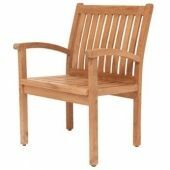 Notes: This teak chair is made in Bali, Indonesia using durable teak wood. Our teak arched armchair is great to use at the patio dining table of as just a side chair. The contoured back and wide slats give this chair an attractive look. This teak chair is also very sturdy and comfortable.